Nimbis Services, Inc., is a trusted name in collaborative high performance computing. We help build communities for design, modeling, simulation, and analytics in the cloud. Driven by customer demand, our e-commerce products and services are ever evolving with unique capabilities that provide secure and collaborative multi-organization, multi-site cloud based communities of interest which include: community inspired marketplaces of applications, libraries, APP workflows, IP and diverse data. Initial collaborative cloud platforms are now available for DoD microelectronics and Smart Manufacturing supply chain communities. 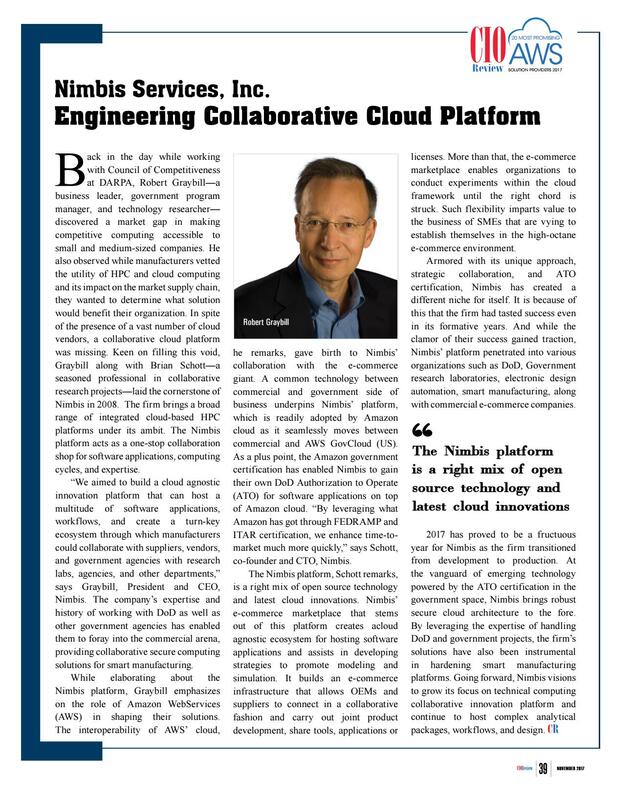 As a neutral cloud services broker, Nimbis is rapidly expanding to offer a family of collaborative cloud communities of interest creating distinctive opportunities for software, APPs, workflow IoT, and process workflow providers to innovate in a protected and reliable environment with end-users uninhibited by existing IT silos or insufficient IT cloud expertise. Nimbis was founded in 2008 by HPC industry veterans Robert Graybill and Brian Schott to act as the first nationwide brokerage clearinghouse for a broad spectrum of integrated cloud-based HPC platforms and applications. Our fully integrated online Technical Computing Marketplace comprises several stores hosting modeling and simulation applications on HPC platforms in the cloud. The Nimbis Services Technical Computing Marketplace connects sellers of technical computing applications on high performance computing platforms to small and medium business in the manufacturing supply chain in an easy, secure, pay-as-you-go, and worry-free environment. Buyers get affordable and fast access to the applications they need so they can focus on innovation instead of infrastructure. Sellers have an outlet to offer their applications and expertise that is promoted to the buyer community.